Dr. Aikyna Finch is a walking encyclopedia on all things social media. She’s a Podcaster, Social Media Coach, Speaker, and Author who’s also a contributor for Huffington Post, Goalcast, Forbes and Thrive Global. I first discovered Dr. Aikyna Finch through her AWESOME the Social Power Summit, which she founded for Women in STEM and People of Color in Social Media to have a platform where they can shine. I’ve been following some of the stars from last year’s summit and WOW – they are doing it differently and shining bright! So, although there are many topics I could interview Aikyna on – we settled on a nice practical one for starters – How to showcase your coaching business on Linkedin. My favorite part of the interview is when Aikyna tells us EXACTLY what to do in 20-30 minutes a day to best capitalize on the amazing Linkedin platform to gain coaching clients. Benay: Hello and welcome. I’m Benay Dyor, the Coach Guardian. And welcome to Coach Pep Talk, the podcast for people who run their own coaching businesses. Each week I talk to an expert who shares wisdom that helps us be better coaches and better coaching business owners. 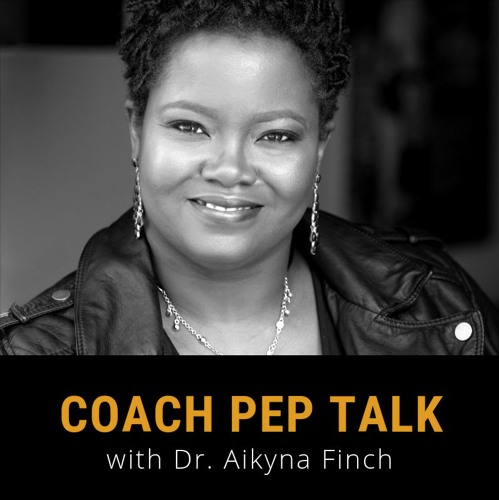 This week I’ve got Dr. Aikyna Finch on the call and she’s talking to us all about how to showcase your coaching expertise on LinkedIn. Sponsor: Have you been looking for a way to manage your coaching clients remotely? Well, I’ve got just the tool for you and it’s called Life Coach Office. Life Coach Office is an online coaching client management platform that takes care of your invoices, your meetings, your client journals, online lessons, your resource library, and so much more. But the best way to know if Life Coach office is going to work for your coaching business or not is to jump in and give it a try. Go to lifecoachoffice.com to sign up. Benay: I first heard Dr. Aikyna Finch through her Social Power Summit, which is a summit that she founded for people of color in social media so that they could have a platform where they can shine. I’ve since started following some of the speakers at that event and man they are a breath of fresh air. Totally check out the Social Power Summit. But there is a whole lot more to Aikyna than the Social Power Summit. Not only is she a coach, and a podcaster, and a trainer, she is a contributing writer for Forbes, Huffington Post, Thrive Global, and that’s just to name a few. And she’s got degrees… I don’t know how she fit them all in. She’s got a Doctorate of Management, an MBA in Technical Management, an Executive MBA. She’s also got degrees in Marketing, I.T., Project Management, and get this, Aeronautical Technology. I’m guessing that was when she was quite a lot younger. Now what Aikyna really turns her passion and attention to these days is helping you create demand for your supply using social media and technology. And she walks her talk. If you look at her Instagram account you’ll see that she’s got over 10000 followers just there. She’s on all the platforms and man, I can tell you that Aikyna is a walking encyclopedia when it comes to all things social media. So I’m so excited to bring some of her wisdom to you guys. And in this episode, we’re specifically focusing on what she’s got to say about Linked In. Enjoy the show. Benay: Hello Aikyna and welcome to the show. Aikyna: Hello! Thank you so much for having me. Benay: This episode is really going to be all about helping coaches learn how to showcase their expertise on LinkedIn. It’s something that I’m personally really curious about. It’s a place where I know that a lot of my ideal clients hang out and I haven’t invested very much time or energy other than just kind of having my CV up to date in LinkedIn. So I’m really curious, for the audience and for my myself as well. So I really I’m looking forward to what you’re gonna say today and I’m looking forward to doing the homework or whatever tips come out of our interview today. Aikyna: Oh wonderful. I absolutely love LinkedIn. I’ve made some of my best business connections there as well as coaching and I think that is going to be a great interview for this today. Benay: Perfect. Okay well, let’s get straight into it. I was wondering if you could start by telling the audience why you think LinkedIn is such a powerful platform for coaches to be using? Aikyna: It is a powerful platform because believe it or not they actually have a tool in there that helps you gain clients. And a lot of people don’t even know that it’s there for coaches. I get daily notices of people who are looking for coaches in different types of areas and all I have to do is put in my bid. Benay: Wow. And do you need to do something special, like have a special LinkedIn account to do that? Or is it something that just the free, you can do with your free account? Aikyna: I know a couple of people who are doing it that have the free account. So yes you should be able to do it with your free account. It is called Pro Finder, so ProFinder has a freelancing, such as if you are creative. So if you’re an artist, or you do graphic design, or what have you. You could get some things there if your a coach and it will tell you business, executive, you know all these other types of coaching lanes. You pick your coaching lane and then you put a little bit about yourself in the bio and so that’s why it’s so important that you tailor your bio to your coaching business because they’re going to go and look through the bio when they go and pick you up for you to be their coach. And so having that bio in place, having that summary in place, and then, of course, having that heady tag line is so important because that’s usually what draws them in to go and look at anything. Benay: OK I think we might revisit some of that. So I heard the bio is really important, your tag line, did you say? Benay: Tag line. And there was, was it an image as well? Aikyna: Oh yes you definitely have to have a professional image. But your bio and your, which is what I call the summary, and your tagline which is the heading up there to top right up under your name. Those are very, very important areas that a lot of people miss out. And but that header is the one thing that spikes their opinion, you know their attention for them to actually keep reading in. And then with your header, you need to make sure that those first two sentences pop. Because if they don’t pop, people don’t read past those two sentences. Benay: Got it. I don’t know, this is like kind of throwing you a curveball but can you give us, like a what is a sentence that pops, like what’s an example of a sentence that you would say pops? Aikyna: OK so most people say…so I’ll just do an example of me. So before when I first started I would say Dr. Aikyna Finch, Educator, Motivator, Lover of Social Media. OK. All right. So what does that mean, right? Versus Certified Coach, Author, Speaker, I help you create a demand for your supply. And that pops because I’m telling you what I’m going to do. “Ohhhh create a demand for my supply. I have a lot of coaching programs that I couldn’t sell right now and I need people to buy them. Therefore she’s going to help me get people to buy my products that I already have sitting here waiting for the audience to take advantage of.” So that is why that would pop because they would see their sales in my sentence. Benay: Yeah. See them. I love that. That’s nice clarification. Then also, I mean your sentence also has that embedded, what’s it called, expertise, that you are the expert and you’re certified and professional and whatnot. Aikyna: Exactly. And a lot of coaches are really downplaying that. I see a lot of ACC, PCC, MCC’s that are not putting that out there on their platforms. Why not? You earned this. You are an expert in your field. You are teaching other coaches how to be coaches, but you don’t even put your PCC’s, or your ACC’s, or your MCC’s on your name. That was the first thing I fixed when I did this because I am very passionate about my craft and I want people to know that I went and got the extra education needed to service them the way that they need to me service them. If that makes sense? Benay: Yeah definitely. And for anybody who’s listening that’s not familiar with those acronyms, they’re like I guess certification levels that you get through the International Coach Federation. Benay: OK. So what I’m hearing Aikyna, is that the reason that you really love LinkedIn and you think it’s such a powerful platform for coaches specifically is that it’s got a tool called the Pro Finder that actually helps you gain clients, which is pretty cool. I mean that’s what most coaches want anyway. Aikyna: Now that’s just one feature. So let’s say you’re not ready for that yet. Aikyna: Let say you just want to start networking. Most of the ICF people of different branches have pages out there. You can network in your city, in your state, and start doing different collaborations with coaches. Start seeing what other coaches are doing. Put yourself out in different circles because you know people don’t know what’s there if you don’t tell them. So you need to start getting out there in the presence and in the circle of the other coaches. This LinkedIn is amazing for that. You can get in groups, you can find the information they give. They could look at some of your things that you’re putting out there say, no if you tweak this just a little bit over here then you’ll sell a lot more, or you tweak this over there, you’ll reach this type of market instead of that type of market. And you know that type of feedback, if masterminded is invaluable to a coach and valuable. Benay: Alright. So you actually use LinkedIn to have a bit of a mastermind network? Aikyna: Yes. And also if you are with the ICF, you know you have to take your certification over, you know renew it every three years and you have to learn. You know you have to go to these workshops and renew your skills and everything. So why not? They post all of their different meetings and different things that you can go and get these learning credits right there on LinkedIn and their LinkedIn groups. So you might be sitting there, “Oh how am I going learn, get these learning credits in,” and you know I’ve seen a few on the website, but you go to LinkedIn and people will tell you, you’ll see all these different places that you can go that’s more unique to your style. Definitely check out these coaching groups. Benay: OK. For somebody who is not on the International Coach Federation path and they like the idea of maybe networking, collaborating, masterminding with other coaches using LinkedIn, how would they go about it? what would you suggest they’d start looking for? Especially their new to LinkedIn and they’re not like not really familiar like even with the different options that are even out there of communities and groups you can connect with? Aikyna: Well I mean most of the coaching groups are it’s lucky that they usually put coaching in their titles. So I would start with a nice search on coaching and I would go to the group section and filter out through there. Most of them will let you in, the public groups will let you in and let you get a feel of it, you know before you decide which you want to join in. Some of the private ones will give you a synopsis of what it is before you decide if you want to come in and they will let you in. So there are some private groups that only just want their particular people in there. And then there are some groups that just open for learning and masterminding and go ahead and do those search. Those search, the searches are amazing. There’s so many people that can find you and make sure that you’re keyword coaching is in your bio, in your header, all those things because those are what LinkedIn uses to prop you up in the People section. So you could be in this area with this person who needs coaching. They’re not ready to use ProFinder yet. They may just want to go through and say coaching and your name should pop up. Your name should pop up if they say, coach, coaching, you know Coach certified, you know whatever it is, your name should pop up and whatever arena you’re in, whether you’re in wellness, whether you’re in a tech, whether you’re executive, whether you’re business. Make sure that you have those keywords in there as well because people will make sure that they scan the gamut before they go in and start trying to contact the person. And you want to make sure that your face is on that front page every time they look for something so that they know that you’re the right fit. Benay: Wow. OK. How do you get on the first page? Aikyna: That is a good question. How do you get on the front page? Now, I usually am pretty good with first and second pages. I make sure that first off you want to make sure that you are an all-star, that means that your profile is complete. And they will let you know on your banner because it starts out with you know getting started, then they’ll say intermediate, then it’ll say all-star. And you want your profile to be all-star. Once from the search rate from intermediate to all-star is twenty-seven percent more seen. Aikyna: They put you in more a twenty-seven percent more searches once you hit all-star. So that right there is enough to get you started. You know to make me want to go all-star. Then the next thing is making sure that your skill set, all the coaching skills that you do, make sure that you have those in the skill set area for the recommendation. Make sure that you have it in your summary. Make sure you have it in your header and that way you’ll start coming up. But if you have it in your header and your all-star you most likely to be on the front 2 pages. Benay: Right. OK, so it doesn’t sound like it’s actually that hard. Aikyna: No, no, no, no. But you know and it all depends on your interaction too. Because you know if they don’t, LinkedIn is very, um, how do I say this, it is about the algorithm. So if you are off two or three weeks then you go down in the bottom. Versus, if you’re on there every day and you know you’re engaging and whatever, they give you a reward by pushing you up to the top. Benay: Right. OK. Instagram is sort of similar, isn’t it? Aikyna: Just putting on a picture, or if you have an offer you just posted a post, or even if you just want to write an article in the post section, you can read an article. And all that is considered engagement and you can go for it. Benay: So you can post an image, you can write an article, you can share…what did you say, you can share…an offer. Benay: OK. And when you are interacting on LinkedIn are you posting on your page? Kind of like for people who are familiar to Facebook, is it similar or is it really different? Aikyna: No actually they have what is called, your page is your profile just like on Facebook, and then your company page is just like your business page on Facebook. Aikyna: So you can actually make a company page and it has the stats and you can put in your websites and all that and you can put in pictures, videos, articles you’ve written, and so the page is all about your company. And then when you make that company page this is how you can tell if somebody who has a company page, when they put their experience in a bio if there is a grey little hotel right there, they don’t have a company page. If there’s a logo there, they have a company page. Benay: OK so I’m going to circle back a little bit. You know we kicked off the interview talking about why is LinkedIn such a powerful platform for coaches, and you said well it helps you gain clients, and it helps you start to network and mastermind with other coaches. Was there anything else in your sort of why for LinkedIn that you wanted to cover before we move on? Aikyna: I think also with the why it actually help you cultivate your audience because especially if you’re trying to B-to-B clientele, you know most of the other social media platforms are for B-to-C. B-to-B is another way that people are going with the corporate clients and corporate coaching and so if that is something that you’re interested in, you make sure that you put that out there because a lot of businesses are on LinkedIn looking for that next expert to bring into their business. So make sure that you include that in your summary of things that you do. Benay: So include in your summary that you work with businesses. Is that what you mean or…? Benay: And is LinkedIn also a powerful tool for working with individuals? Aikyna: Oh yes that’s where the Pro Finder comes in and that’s where all of the searches and things come in. So yes most definitely. But it’s just better than other platforms for the B-to-B. Benay: OK. All right. Perfect. I think you’ve built a very compelling why we should all be thinking about LinkedIn. So what I’d like to do is change tack a little bit and let’s talk about some practical things. So if you’re really new to LinkedIn and maybe you have a page, a personal page, maybe you don’t. Or you know you have one but it’s just like just really basic, what are the first things that you need to do to be able to really get that right? And you kind of dropped some different ideas already but maybe we can summarize some of those and you can expand on them in this in this segment? Aikyna: All right. So things you need. First off, they give you points for your profile picture. They give you points for your name and your header. At least one place of expertise, and one place of school. They also give you credit for any recommendations you have, as well as any skills you have. If you do volunteering, if you have an award, and things of that nature. Also if you are a publisher, do you have any public works? Go ahead and put those in there. Then, of course, you want to start really homing in on your niche in the skillset. Because they use that skill set area, not only for people to give you quick recommendations, but you also, they use them in the search engines to bring you up a little further. And give more people a way to get to you. Benay: OK. I have a question about that. Actually, I have a couple of questions already before we move on down the list. So with your skill set, I know that like I was in a really different career before I got into my coaching business. So I’ve got some technical, business analysis, usability stuff, which actually is really relevant to what I’m doing now but I don’t want to be searched you know and be asked you know like I’m not a usability specialist anymore. I use it in my current job but it’s not really what I want to be known for. So would you get rid of those from your skillset? Like if you did transition from a career to your coaching business and you’re actually doing quite different work now? Or would you leave all that stuff there? Aikyna: OK. So the first five are going to show up all the rest of them or not. You can be pretty brief in your summaries, in this education section, and the experience section for the things that you no longer do. So kind of like before when I was more into education, my education section was a lot more robust. Now it’s she did this, she did this, she did this. OK. She was this. And then you know then we move on to the things that I’m doing more of now and I make that more robust. Aikyna: It doesn’t look good to have the hole there, so feel the hole. But you don’t have to put, maybe one or two sentences down. That way you don’t get searched for that and then when you go into the skill set, you don’t have to put those particular skills in there unless it is gonna be a benefit for a coaching opportunity you have in the future. Benay: Great and in that skills area would you just want to have like five skills, or you know, I think right now I might have, you know be recommended for like 30 or 40 things from all my different past jobs that people have recommended me for. Is that good or bad? Aikyna: Oh you could go up to 50. They don’t stop you. Benay: All right. OK. And that’s ok, it doesn’t dilute your you know your attraction? OK.
Aikyna: No because the first three are the only ones that are really seen, after that they go into this little box and they can click on it to see the rest. But they give the top three first and then the rest of them are up under there so. Benay: Right. OK. OK. And then my other question before we get back to the list was you mentioned published works. Do self-published works count or does it need to be like an officially published on Amazon or by a publisher or something? Aikyna: Oh no, no, no. You know Amazon is, you know even know it is self-publishing, Amazon is up there with many. So yes. Put you published works on there. And I have gotten book sales because I put my published works on my LinkedIn. I have gotten product sales because I put my T-shirts on LinkedIn. So you know put it out there. If you do it, you do it. Benay: Uh huh, wonderful. OK. So please carry on. You had just finished talking about honing in on your niche in your skill set. Aikyna: Also at the bottom, you’ll see different interests. I would go in and find some of the people that you’re interested in. They do have what is called influencers. And if you click on some of these influencers they will actually put different articles in your feed that you will find interesting because you chose these particular influencers, and it’ll be information that you may have not known about because you know you just may not be in that circle, but you learne so much, and then you can share it on your business page, or you can share it on your personal, and you could start educating your audience with the information that you’re receiving. And it might be actually good because one thing that we tend not to do as much is share other people, you know who may be experts in the field, by sharing an article and saying, “Oh, author you are amazing. This was an amazing piece. I would love for you to expound on this-this and this.” They’ll come over, not only will they follow you but you’ll have a good conversation and then your conversation that you started will be seen on their platform with their people. And now you’re in front of a whole new audience that you would have never met if you had just been like, oh it was a nice article and clicked push. Benay: Wow, ok, great tip. All right is there anything else that a coach that’s just starting in LinkedIn needs to think about to get set up properly? Aikyna: Basically you want to, I say at least be a, get your all-star status together. And it is a checklist and they will show you what you need to do and they’ll tell you how your advancing. And they’ll tell you when you get there. Now some, of course, we know people don’t, they have things about patents and courses and things like that. They don’t put as much weight on them because they know that not everybody is going to have a patent in life. You know those type of things. But you know people do have education. They do have a, you know some type of work experience. They do have a picture. They do have a bio and they do have something, a sentence that tells the world about them with style and flair. So that’s what you get accounted for. Benay: OK cool. All right. So let’s talk a little bit about the workload that like you need, for example, to really make LinkedIn work for you as a platform. How much time are you spending on LinkedIn each week? And what would you recommend to a coach who might just be starting out in this platform? Aikyna: OK first off, start being social. Because you never know who is going to be your next lead or your next client. LinkedIn individuals tend to follow your post first and then they’ll start sharing your posts. Then they’ll start speaking to you on your post, and that’s when you know you have a captivated audience. And when they start speaking to you about that particular item, that’s something that you need to start honing in on and you need to start posting more. So they’ll let you know what you need to put out there because the one good thing about LinkedIn, is the moment that somebody likes your stuff, it goes right into their feed and all their friends can see. Aikyna: So that is a great way for you to get your articles out there, your information. Make sure that whatever picture you put out, whatever post you put out, you make sure that you have your social media handle, your email address or your website address on it so that they can contact you because they will. If they either click on your picture and send you an inbox or they’ll go to your website and, or they’ll send you an e-mail. They will reach out to you. And that’s one of the good things about having LinkedIn in your life, whereas Facebook, you know you have to get a whole bunch of different interactions before you know 15 percent will see, see you. You know, whereas, as soon as they click it everybody in their platform can see. Aikyna: So you need to leverage that opportunity. Then that also includes businesses that they’re attached to too because a lot of people are now following business pages. So if you have a coaching business, go ahead and make that company page, and give your company a presence on LinkedIn, not just yourself. My company Finch and Associates has a presence just as much as Dr. Aikyna Finch does. And I tell people, especially coaches, you do not have to be McDonald’s in order to have a company page. You make money. You help people. You need to have the same opportunities to be out there in front of everybody in order for them to know that you are here and you’re ready to serve. Benay: OK. So and how much time do you actually spend on LinkedIn? Or what do you recommend? Benay: Per week or per day or…? Aikyna: That’s a hard question for me because I do social media coaching for a living. So mine is a bit longer. But honestly, you can stay on there probably 30 minutes to an hour and be just as effective. As long as you have your strategy together. Aikyna: You know if you are putting out targeted posts with call to actions and tidbits for the people to learn about that, you know you’ll start seeing them in your inbox. You’ll start seeing them following you, friending you because you’ll come up in their different searches. So as long as you are keeping that energy moving every day, then you will be seen. Benay: OK. So 30 minutes to an hour a day you recommend. OK. And when somebody sends you a friend request in LinkedIn even if you have no idea who they are, do you always accept it? Aikyna: So I go to the person’s page you know and I’ll look and I’ll see if we’re in alignment. And then I will accept. Aikyna: If I see it as they have some interest or some background. You know and you can always ask them because I’ve had people if I’ve sent them a request because I don’t care about the industry. I care about how I feel when I see the profile. If I feel excited and motivated to work with this person or know this person. I’ll send them a request. And some people have said you know what attracted you to me and I will let them know. I said you know you had this, this, and this and I thought this was an amazing thing. And they’re like, “Oh, wow, thank you. Yes, let’s get talking. Let’s do this!” And from there I’ve gotten many JP partners from that. Aikyna: So and I’m going to explain what you need to do in the hour. The 30-minutes to an hour. Aikyna: First you need to post something. Make sure its an article, picture, quote, what have you. Post something. Then you reach out to, you check out who has tried to friend you. Take the time to do your research there. Then I would say do a search in your arena and see, I would pick two or three people to friend, send friend requests to. Why? Because you need to start your networking, get your things out there in front of people. And then also I would check, you know what type of groups they’re in because you can actually see the groups that they’re in. And I will go and check one or two groups out to see if you are in alignment with that. And also when you are in groups, you need to choose groups you like. But you also need to choose groups that your clients would be in. And then that way you could post your information in the groups that your clients are in. And being in the things that you like is going to develop you. You could ask your questions about how to reach your next elevated state if that makes sense? Benay: Yeah definitely. That’s excellent. That’s really targeted you can sort of have a checklist, because I know I’m new to LinkedIn, but in Facebook, like you can really get lost in the weeds if you don’t have like a checklist like I’m going to do this, this, this, and get out. Your whole day can quickly disappear. Ok, so I want to ask you about re-using content. So let’s say that you’re blogging, or you’re podcasting, or you’ve got content on other platforms already. What is your advice or recommendation on using the same content across multiple platforms, specifically in this case LinkedIn? Or does it need to be like do you need to create original stuff in LinkedIn every time? Aikyna: Oh no, no, no, no. So most people share their article, so I write for HuffPost, I write for Forbes, Thrive Global, things like that. So what would I do? I would share those articles from those platforms and put them on LinkedIn and start a conversation at the top of it, say you know I would love to hear your thoughts about this motivational piece and how you would use it in your coaching atmosphere. And then and put the, and then the link would pop up there and they would click on the link and they would go read it, and believe it or not people do comment and you know start a good the conversation off of it. Even if they just liked the piece then once again your articles in front of a brand new audience that it wasn’t in front of before. And it also gives the person who shared it you know more reason to start looking at your company page and more things that your posting. Then after you shared it off there, you can also, if it’s your personal blog, you can share from your personal blog, or you could do what is called a pulse and they have their own little blog and section in LinkedIn. And you can use your information and then put the link to your blog at the bottom of it saying this is just a snippet of what I was writing and for you to see the full article click this link and it will take them back to your blog. So you’re getting SEO off of that. Aikyna: So you get more SEO because they’re gonna see it because LinkedIn is going to promote their product before they promote you know a link. And then once they promote their product, once they go in there read it they can put the link in there. And you know for my podcasters that do podcasting or videocasting, blogging, you know bloggers are bloggers and are podcasters and if you’re a blogger you can put the video that corresponds into it and guess what is on YouTube? And guess what it has your watermark on it. And as soon as I click on the video they click on your watermark they’ve signed up for your YouTube channel. And you put in your podcast, you know let’s say you’re on iTunes or Soundcloud or whatever, there’s a little button for them to sign up for your stuff right there. You know and they haven’t even left LinkedIn you know. So that’s of course, using, repurposing content for the greater good is what I call it. Benay: That’s wonderful. It’s wonderful. I’ve got you know I’ve got a series of things that I post on Facebook every day like an inspirational quote, or testimonial, or a link to something from my archives, or link to new content, I’m doing that regularly on Facebook. Could I use the exact same scheduling and just put that over in LinkedIn or would you …? Benay: So you can do that? OK. Wow, that’s really exciting! OK. Another question I want to ask about and then we’ll wrap up, I’ve got three more. Is. let’s see, where was I gonna go with that, nope it’s left me. I’ll move on to my other one. It sounds… What I’m loving about when you’re speaking Aikyna, is the intention that you’re bringing to this platform. Like there’s something really heartfelt, connection based, and also business savvy about you and your intention and what you’re doing in LinkedIn. So I was just wondering if you could give it advice because I think intention is everything when you’re as a coach and when you’re approaching the different projects you’re working on. Could you talk a little bit about your intention when you’re using LinkedIn and how that’s really serving you? Aikyna: Well you pretty much hit me on the head. You know, because I am definitely a servant leader and I lead from, I’m very heart-centered. So when I go in, I go in with the intention of who can I, whose life can I make better today. With my coaching, with my inspiration, with my what have you. And in the process it, first off helped heal a pain point for someone, also gives them some information that they can take on through their day, and then it also gives them awareness to if they feel like they need to continue on with the service, they can do so because there’s a call to action there. Okay? I do it subtly. So with mine, I do my quote of the day, I’ll put a little saying about the little quote at the and I’ll put my hashtags in because now LinkedIn is using hashtags, and then I will put in my business page at the bottom. So if you’re interested in knowing more about me and what I do, there’s the business page link that you click on and go over there. Benay: That’s perfect. So you’re blending everything. You’re blending that heart connection and then with that business savvy call to action with every interaction. Benay: When I think a lot of coaches, and correct me if you’ve seen a different experience, but they can like remember to do the heart bit and then forget the call to action bit. I know I’m guilty of that. Benay: I’m getting better. This is my year. This is my call to action plus heart year. Aikyna: I love it. And we do, we’ll get wrapped up in oh this, this and this, and oh don’t forget this and this and then you wrote this beautiful epilogue and then you forgot to tell them how they can find you. Benay: Yeah, exactly, exactly. I remembered the other question that I got stumped on before, when you were talking about you know what you do on LinkedIn every day, and what you do in your 30 minutes are you posting on your personal page or your business page? Aikyna: I post on my, I started with my personal because I had more followers on the personal, and link my business page into the comments so then I go back to my business page and I will share it over to the business page and so that way they’re always connected and that way when they click on the link they start following my business page as well. Benay: Yeah that’s great. Wonderful. OK. One thing that the question I really love to end on with all my interviewees is if there is one action or one thing that listeners from this episode will take away and do today or do this week, what would that one thing be? Aikyna: I would say get your profile to all-star so that you can get out to as many people as you should be getting out to. Benay: Wonderful. I loved the succinctness of that too. All right Aikyna, how can people, what’s the best way for them to go and find you and learn more about your work and the wonderful stuff that you’re bringing out to the world? Aikyna: Well you can find me on all social media handles at DrADFinch and you can also find me at aikynafinch.com. And if you go to my website today, or if you go to my Instagram you can click on the link up there at the top and you can get a free tool kit that I use, all my techie, social media tool kits. I would definitely check that out and it’s totally free to you. Benay: Awesome. OK. So your Aikyna’s social media toolkit and it’s all free. I’ll include a link to that in the show notes so everybody who’s interested can get access to that quite easily. All right. Well, Aikyna thank you so much for coming on today and talking to me and to our audience. You’re just obviously a wealth of knowledge and inspiration. So yeah it’s just been wonderful. Aikyna: Thank you so much for having me. I enjoyed every last minute of it. Benay: Me too! All right. And listeners thank you again for listening to another episode of Coach Pep Talk. Be sure to go over and like and comment in iTunes and SoundCloud. Love to hear your feedback and get your good karma. Have a great day everyone. And happy coaching.